As if BP needed even more internet ire, someone has been running a fake BP PR twitter account called BPGlobalPR. "The good news: Mermaids are real. The bad news: They are now extinct. 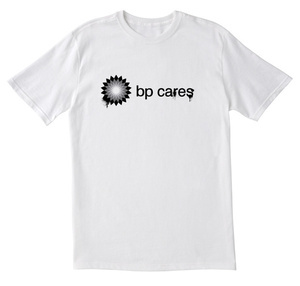 #bpcares "
At first I couldn't see the angle in running an obviously fake BP tweet. Then earlier this week they began selling t-shirts. Its too bad BP didn't think of mocking themselves first - they have less than 8000 followers while the faux BP has over 80,000!